Zimbabwe's Electoral Commission has said that nearly 305,000 voters were turned away during last week's elections, which the opposition has said were rigged. These are the first such official figures - the number of rejected voters has been a major complaint. It also said 207,000 voters were "assisted" to cast their ballot - another alleged source of fraud. President Robert Mugabe gained 938,085 more votes than his main rival. Morgan Tsvangirai, who took 34% of the vote, has alleged massive fraud. His Movement for Democratic Change (MDC) party is planning to file court applications against the results of the presidential and parliamentary votes. Mr Mugabe, 89, won with 61% of the presidential vote and his Zanu-PF gained a two-thirds majority in parliament, with 160 seats compared to 49 for the MDC. 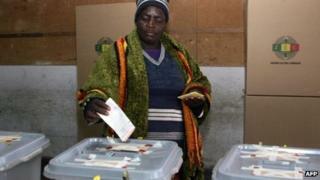 African and regional monitors praised the poll for being peaceful but noted some irregularities. Western observers were not invited to witness the 31 July vote. But a local observer group, the Zimbabwe Election Support Network (Zesn) and its network of 7,000 observers, has said that about one million voters were "systematically disenfranchised" by being omitted from the voters' roll or turned away. The electoral roll has come in for criticism for having duplicate names and the names of dead Zimbabweans - the MDC says it has found 838,000 entries with the same name, address and date of birth but different ID number, 350,000 people who are more than 85 years old and 109,000 aged over 100. The BBC's Brian Hungwe in the capital, Harare, says the figures of those turned away from polling station represents 8.7% of votes cast. According to the electoral commission's statistics, the largest number of turned away voters - 64,483 - were in Harare. The MDC has stronger support in towns and cities and Zesn says voters had most trouble registering in urban areas. In its assessment of the election, the African Union observer mission noted that it was concerned by the high number of assisted voters nationwide. The MDC says that "assisted voters" - supposedly the illiterate or infirm - were made to vote for Zanu-PF. The Zec figures show that assisted voting happened more in the rural areas, Zanu-PF's stronghold, where, according to Zesn, 99.97% of voters were registered. Our reporter says such figures are shocking as the UN regards Zimbabwe as the most literate country in Africa and the number of assisted voters represents 5.9% of votes cast. An MDC lawyer told the BBC on Thursday that the party's headquarters in Harare were surrounded by police and there were fears the office would be raided. The party, which had been in a coalition with Zanu-PF for four years following disputed elections in 2008, is expected file its appeals within the seven days of the results, which were announced on Saturday 3 August. This could be as late as next Wednesday as the MDC's legal team says weekends are not counted and next Monday and Tuesday are public holidays. The court then has 14 days to deliver a judgement. If the court upholds the results, Mr Mugabe must be sworn in within 48 hours of the ruling. A week after the election, Mr Mugabe dismissed criticism of the polls and lashed out at Western countries for their concerns about the vote. "We are very happy that we have dealt the enemy a blow, and the enemy is not Tsvangirai," AFP news agency quoted the president as saying. "Tsvangirai is a mere part of the enemy. The enemy is he who is behind Tsvangirai. Who is behind the MDC? The British and their allies. Those are the ones who were the real enemies." Mr Mugabe has long accused the British of trying to oust him from power in its former colony because of his policy of seizing white-owned land.